The “Berkeley Guest” network is for Non-Berkeley College Students and Associates. It is a requirement that the visitor is with a Berkeley College student or associate in order to approve the guest access. Access is only valid for 24 hours. *Current students, faculty, and staff will continue to use the campus wireless called Berkeley Wi-Fi. Prospective students and visiting professionals can get temporary internet access while visiting any Berkeley College location. This is designed to allow people visiting Berkeley College staff to receive internet access for 24 hours. Berkeley College staff will be required to approve any visitor prior to the guest receiving internet access. Please click on the link for your platform or operating system to be taken to the instructions for joining the Berkeley College Guest Wireless Network. 1. On your Windows 10 machine, click on the wifi icon in the lower right of the screen to open the list of available wi-fi networks. You can see the icon on the right. 2. 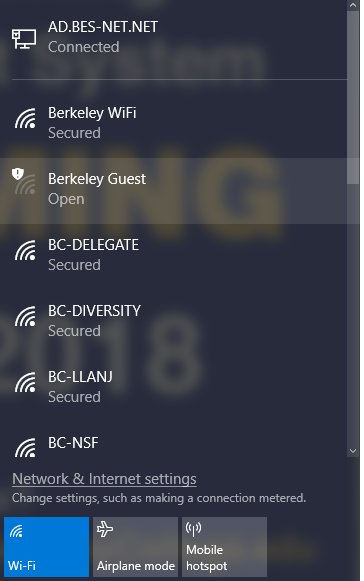 Select the Berkeley Guest WiFi from the list of networks, as shown below. 3. Once connected to Berkeley Guest you will be presented with the following login screen where you can request a guest account or enter in your guest credentials. 5. Click on Request Account at the bottom of the website. Fill out the access request form and provide the Berkeley College email address of the associate who will be sponsoring your network access. Select I agree to the terms and conditions button and click Register. 6. After submitting the request form, the Berkeley College Associate will receive an email from BerkeleyGuest@berkeleycollege.edu asking to approve or deny the request. The Berkeley Associate may need to finalize the approval by logging into the Cisco Sponsor Portal, which will pop up automatically. The Berkeley Associate will receive an approval message from the Sponsor Portal, as shown below. 7. If the request was approved, the guest will receive an email to the address provided on the form. These credentials can be used at the logon page from Step 3. You can navigate there again by following steps 1-3 in these instructions. 1. On your Mac, click on the wifi icon in the upper right, in the toolbar at the top of the screen to open the list of available wifi networks. You can see the icon in the example below. 2. Select the Berkeley Guest from the list of networks, as shown below. 1. 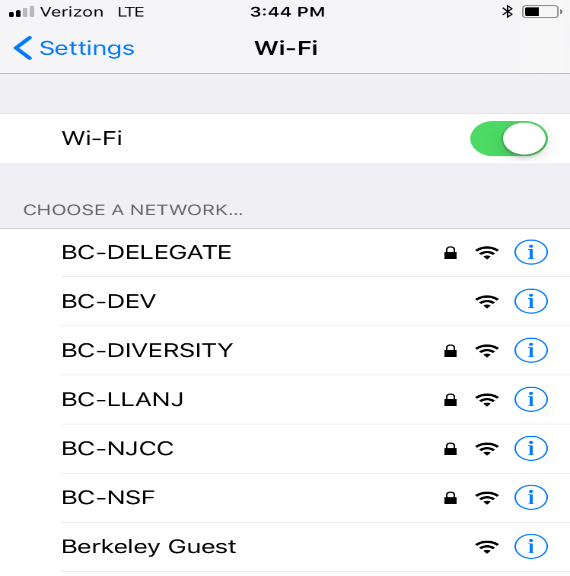 Under Settings in your iphone, access the Wifi menu and select Berkeley Guest from the list of available networks, as shown below. 2. Once connected to Berkeley Guest you will be presented with the following login screen where you can request a guest account or enter in your guest credentials. 3. Fill out the access request form and provide the Berkeley College email address of the associate who will be sponsoring your network access. 4. After submitting the request form, the Berkeley College Associate will receive an email from BerkeleyGuest@berkeleycollege.edu asking to approve or deny the request. The Berkeley Associate may need to finalize the approval by logging into the Cisco Sponsor Portal, which will pop up automatically. The Berkeley Associate will receive an approval message from the Sponsor Portal, as shown below. 5. If the request was approved, the guest will receive an email to the address provided on the form. These credentials will be used on the login screen from step two.